We're pretty sure it's off a red deer, because we've only seen roe and red deer in this wood, and roe deer antlers are much more knobbly with little lumps on. It looks like it fell off by itself. Deer antlers are very strong, and don't get knocked off the skull easily. A couple of nights ago we were on a walk and at the end we were trying to pull up the skull of a eight-point red deer which was partly buried. Daddy was pulling with all his weight to try to pull it out, and the antler didn't break off the skull. Red deer antlers fall off by themselves about March or April, and grow back from April. 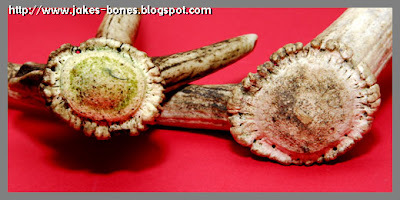 Here's how the new antler on the left looks next to the 'proper' four-pointer antler on the right. It's got a much smaller base. 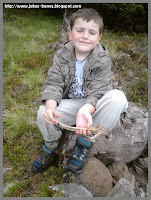 Perhaps what happened is this was a young red deer, and the antler didn't grow into the proper shape. Do you know why it was this shape ? Tell me if you do. Hi Jake - I'm very impressed with your blog! 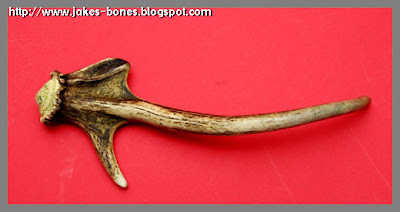 Darren Naish over at tetrapod zoology has a good blog about deer antlers that may help work out why this antler is so odd. My guess would be that the velvet was damaged or not very well supplied with blood, or the deer was malnourished or injured. 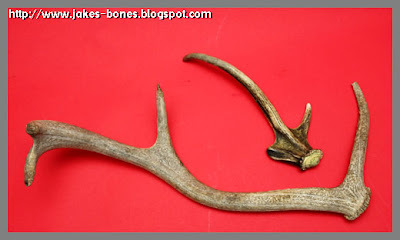 Such factors can play a big part in changing the shape of an antler. Thank you very much ! I think that's might have happened too. It's a cool antler, though.